This is about the body’s subsequent adaptation to the stress that it is put under. There is also the principle of reversibility, which could be thought of as ‘use it or lose it’. Below I’ve selected four graphs which describe Super-compensation. I have chosen to use each one for a different reason, in this order, in an effort to help people understand and apply it to their weekly activity. Whether you are someone who has a busy life balancing work, family and are keen to make best use of limited time for exercise, whether you enjoy a narrow or wide range of types of training, whether you are an amateur or pro athlete, this has relevance across all levels. An interest in science is not essential; an interest in understanding what these graphs mean is really helpful. It should be possible to apply this straight away to best programme out simply what you train and when. How much you improve, maintain, or decline, can be explored using these graphs. Graph 1. Generalised single supercompensation curve. 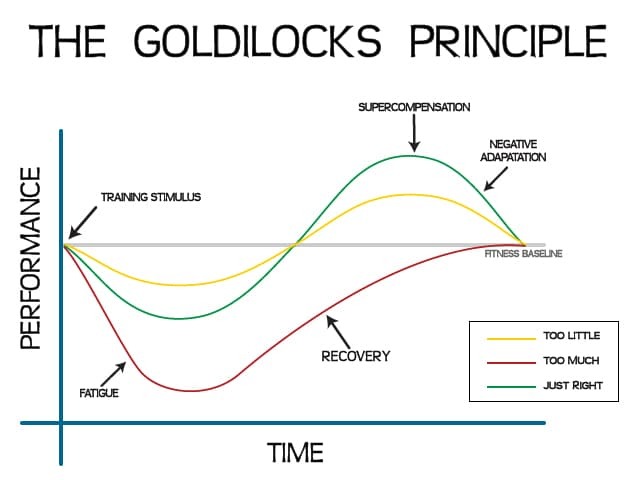 What it does show well and simply is that when we train, we stress our body and so its performance decreases, during recovery our performance increases beyond where it started. After a new level is set, at this peak , performance will then decrease back to a baseline. A simplified graph showing a supercompensation curve. On the y-axis , ‘Endurance capacity’ this could be all sorts of other specific performance measures, or range of general fitness qualities. Graph 2. Not too little or too much..! Like the bear-loving porridge eating character we know, it’s an apt phrase! And ofcourse this region in between too much and too little is the gold we seek! How intense this is, and what load we undertake, that might swing us from one curve to another is specific to us as individuals. The training volume, intensity, and frequency must be appropriate for the particular individual. If training is too intense, the individual will struggle to get back to the baseline, and no supercompensation will occur. A graph showing how recovery and supercompensation may be affected with ‘under’ or ‘overtraining’ per session. If training too intensely: E.g. DOMS for 4 days which makes us feel unable to do some activities or train as we might have done following a more sensible session! It’s better to leave something in the tank, hungry to be active or train with intent again the next day and the next day..
(Ofcourse if we skip exercise/miss it for a few days, this downward trend is what we get). Consistency of regular movement is key for long term health as well as performance. 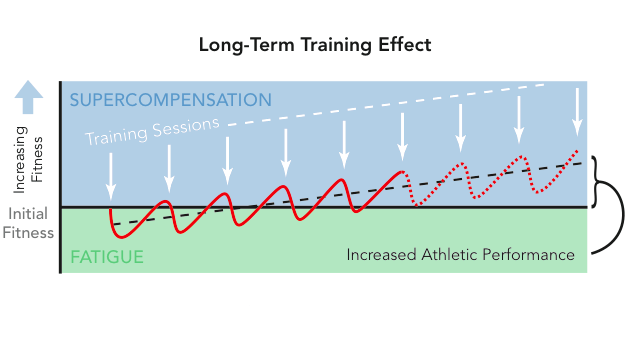 A graph showing long term training effect of timing sessions with supercompensation. So, if we train appropriately, i.e. train again at the time around which we are in peak supercompensation, we can elevate our level above our baseline. Many of my long-term clients can now see how this has happened successfully over time! So this brings me on to the final and most detailed graph. This shows us the different timelines of these supercompensation curves in relation to different specific fitness qualities. E.g. strength training: Peaking / supercompensation adaptions occur around 48-72 hours after training. Can we now see that it is important to do some resistance training twice / week? There are many different ways to train utilising resistance. 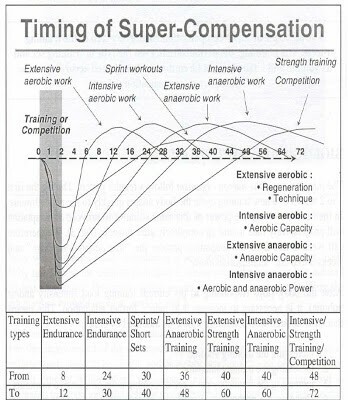 A graph showing various timing of supercompensation with quality trained. There is plenty of evidence around of people making adaptations through strength training once/week, though there are many other factors involved, including what else what other activities are done in the week, and what type of training programme in relation to experience and current ‘baseline’ shall we say at the start of the programme. This also shows why when I work with any of my clients for strength qualities, if I generally see them once or twice a week I will always work the whole body in both sessions, and in case they don’t get that opportunity elsewhere in their weekly activity. If you only work one portion of the body once/week in a certain training method, you are really missing out when it comes to overall performance. Take what you do currently, and picture what a realistic and best training week of yours should look like? Choose the qualities you want to work on , set out in a timeline, to aim work them again at the peak of supercompensation. You can’t do everything at once, but you can train more than one or even two qualities concurrently with skill! This is perfectly possible for you and I in a good routine of doing some form of daily exercise. Want some help designing your own training calendar with all this in mind? Any questions or need some examples? Drop me a line or ping me a message via my chat bubble! – I would look forward to hearing about what you do.